2,500 artists in almost 200 venues; our 2018 program is more varied than ever before. Following up on our recent announcements about ADE by Day, with the first projects on the ADE art route and keynote announcements for ADE Pro and Tech, we take a closer look at this year's festival program. With the latest additions of Amelie Lens (BE), Axwell /\ Ingrosso (SE), Broederliefde (NL), CIFIKA (KR), Kiasmos (IS), Oliver Heldens (NL), Ricardo Villalobos (CL) and Sasha (GB) the 2018 line-up is almost complete. At this year's ADE we expect to welcome around 2,500 artists in a almost 200 different venues! Pictured above is a selection of the names announced so far, all announced artists can be found at a-d-e.nl/artists and a-d-e.nl/program. 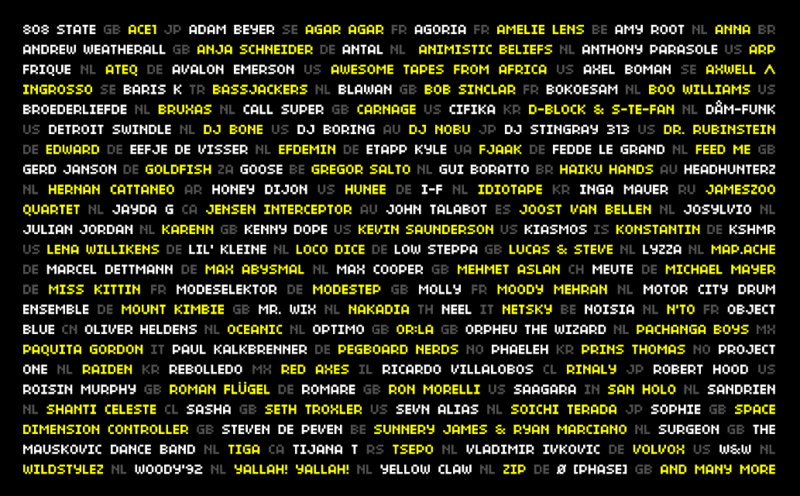 Not sure where to go, looking for your favorites or visiting ADE to discover new artists? Use your ADE account to cut the extensive program back into a personal route with the help of your Facebook and Spotify preferences. You will also receive suggestions based on your favorites! Single tickets for ADE festival events can be purchased here. Looking to get access to the complete day and night program? Please note that the rate for the ADE Pass goes up on September 1st. First time visitor? Here is everything you need to know.